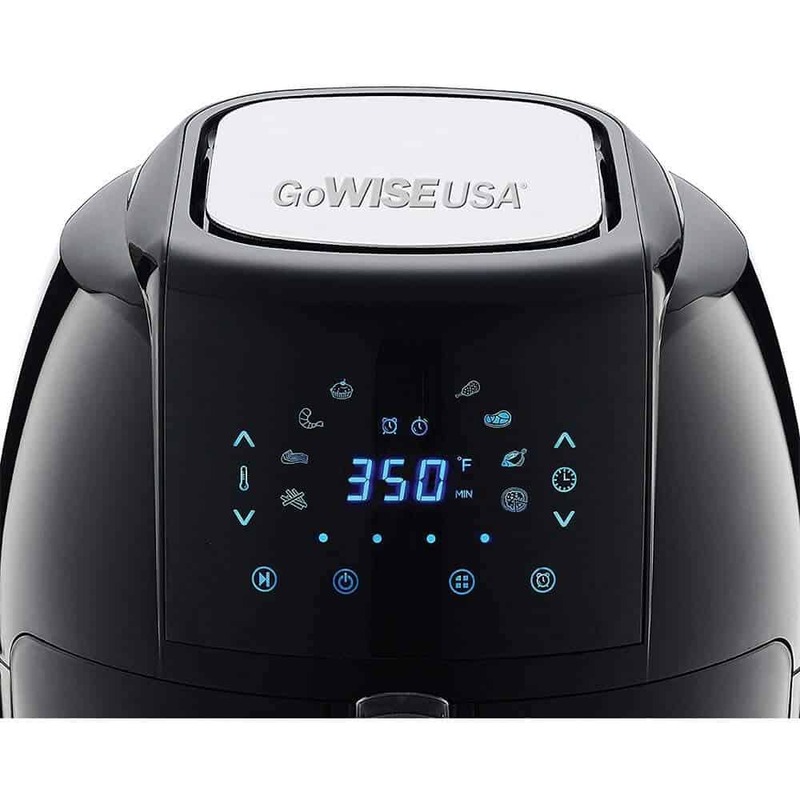 GoWise Air fryer is pretty amazing when it comes to cooking anything you put inside this air fryer, however, in this review, we would go a little in depth about each of the GoWise Air fryers that are available and how they are different from each other. The GoWise Air fryers have become pretty popular on Amazon and they are pretty good fryers but they too have their own downsides which you might want to consider before investing your money in these fryers. Air fryer, in general, is perhaps the best way to lose weight. This Fryer can definitely help you control your junk food eating habits as you can make healthier snacks with the air fryer. We have cooked French Fires, Chicken nuggets, Potato crispies, French fries and veggie pops inside the air fryer with little to no oil and they have turned out amazingly well. Except for the French fries, I was happy with the results I got with all the other dishes as we used not more than 1 tbsp oil to fry them. The rapid hot air circulation technology used in these air fryers cook food like they have been fried and gives them a crisp coating no top with soft and juicy insides. 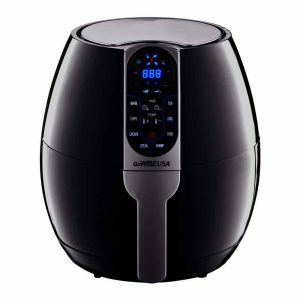 I found a few different GoWise Air fryer models and let’s see each one of them and look at the features of the best air fryer and which one offers the best price/feature balance. This is the most affordable air fryer that you can find on Amazon and probably one among the best when you consider all the basic yet important air fryer features that it has to offer. 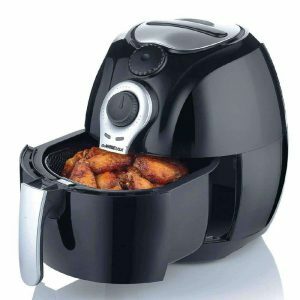 The air fryer is medium sized and you can easily cook fries and chicken wings for 2-3 people. The air fryer is amazing when it comes to the temperature range and the timer settings as well. • The air fryer is easy to use and you can easily place it on your kitchen countertop as it takes very little space. The Airfreyr is light and portable as well. 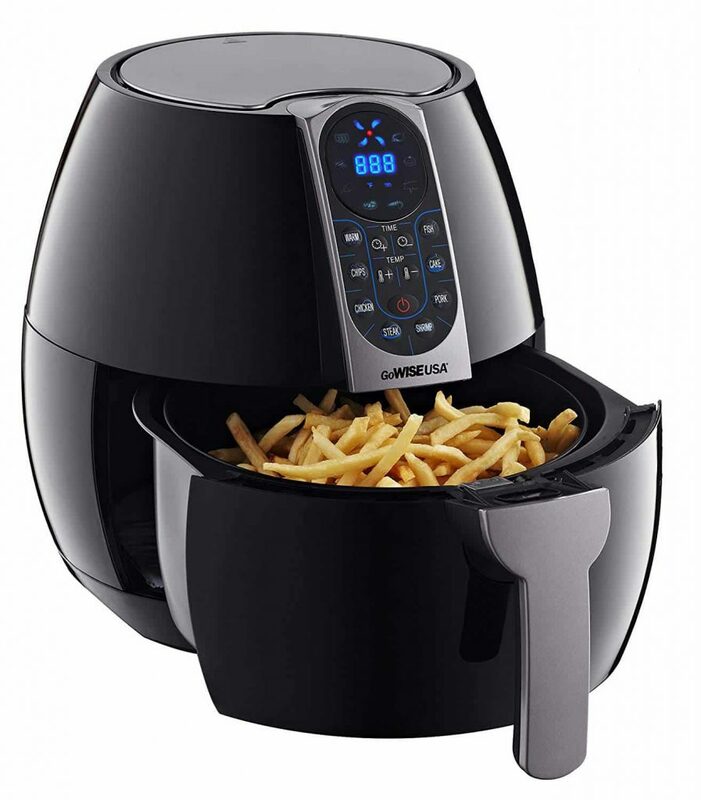 • The Air fryer has a medium capacity and you can easily fry food in this air fryer for 2-3 people. 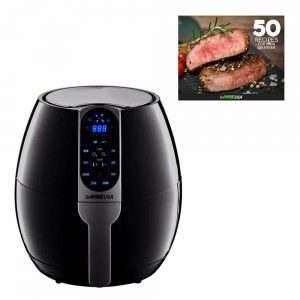 • The timer settings and temperature settings on this air fryer are pretty amazing and in the case you want to cook something, then you just need to set the time and temperature and go about with your business. The air fryer stops working once the timer is done. • The food cooked is pretty good and you do feel like it has been fried. However, you might want to turn your food around in the frying basket to get some even cooking. 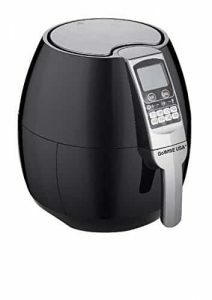 • Good air fryer for someone who is a student or is living alone. You can easily cook some chicken nuggets or chicken wings when hungry. 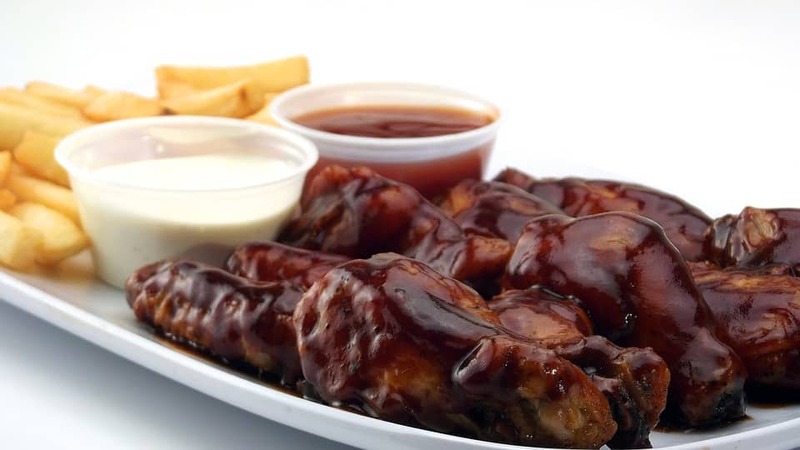 • The air fryer is easy to clean up. 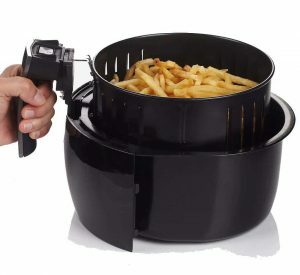 • Many users have found that the air fryer stopped working within a few weeks of usage, however, you do get a replacement because of the warranty period of a year that comes along with the purchase. This model from GoWise is a bit advanced as it has the LED dial and pre-settings so that you have a preset temperature and timer to cook different things inside the air fryer. Something nice about the pre-settings is that you have an idea of how much time you need to cook something, even though that is usually specified in the cookbook but if you are too lazy then the pre-settings come really handy. However, you can increase the cooking time of cooking as per your liking if you want the food to be crisper. The air fryer is a major upgrade from the previous model. • There are preset temperature and timer settings that you can use to cook food without looking at the cookbook every time. This makes cooking really fast and easy if you are in a hurry. • The air fryer comes with 8 presets and they areWarm-Up, Chips, Chicken, Steak, Meat, Cake, and Fish. You can set the timer anywhere from 0-30 minutes and the temperature control can vary from 180-400°F. • The Airfryer is really easy to clean and maintain. • The paint peels off slowly from the frying basket which is a bummer. Some customers had difficult exchanging the fryer in these cases and that is a major con for this air fryer. 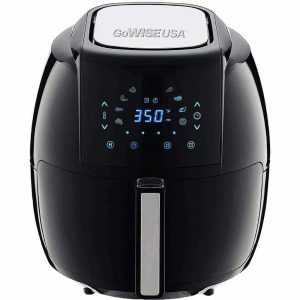 This model from the GoWise USA is a slight upgrade from the previous one and you would find a few minor changes in this air fryer. The air fryer has 8 different pre-settings, which is similar to the previous air fryer, the only difference we felt was the design of the air fryer and maybe the rate of cooking. Honestly, we didn’t find much of a difference and the problems between the two air fryers kinds of remained the same which was the peeling of the base layer. This is the only irritating problem that we can across these air fryers otherwise they worked well. This model and the previous model worked pretty well while the first model is a hit or a miss when it comes to working as well. Taking a break from the rant let’s look at the pros and cons of this air fryer and how the pre-settings are slightly different than the previous air fryer. • The air fryer has a digital display and you can set your time and temperature accordingly. If you are in a hurry then you have preset timings and temperatures that you can use in order to cook food inside this air fryer. • The air fryer comes with 8 presets and they are warm up, fries/chips, chicken, steak, shrimp, pork, cake, and fish. The settings are exactly the same and you can set the timer anywhere from 0-30 minutes and the temperature control can vary from 180-400°F. This air fryer is lovely and comes with a whole 6 Pc. kit. 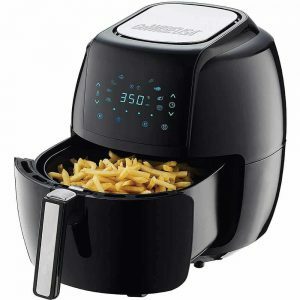 If you want to get a complete air fryer to cook meals and fry food then this model from GoWISE will not disappoint you. This air fryer is the best that GoWISE has to offer in terms of features and the air fryer is large enough to feed 4 people and more. It is probably one of the best air fryers that we have seen from GoWise with pretty similar features to the previous models of the air fryers. • Like the previous models, this air fryer has a digital display and you can set your time and temperature accordingly. If you are in a hurry then you have preset timings and temperatures that you can use in order to cook food inside this air fryer. 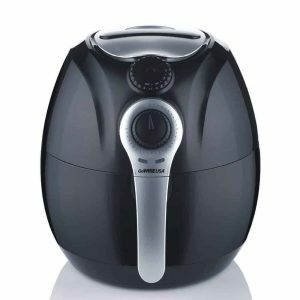 • The Air fryer has a medium capacity and you can easily fry food in this air fryer for 4 people. • It comes with a 6 pc. accessory set that lets us cook anything and everything with ease inside this air fryer. It comes with a cookbook that has around 50 recipes which means you can experiment a lot of dishes with the fryer. • The paint peels off slowly from the frying basket which is a bummer. This is one of the most repetitive complaints on the fryer, however, I must admit that this model had fewer complaints than the previous one. 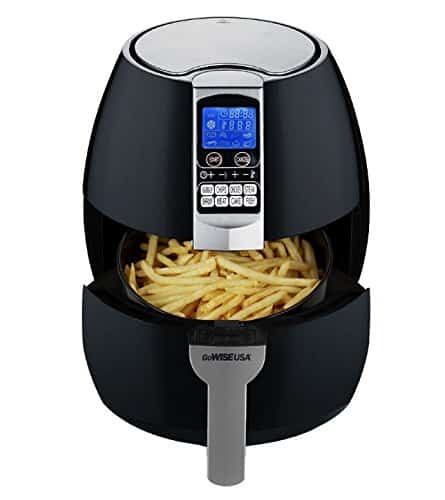 All the GoWISE air fryer models were pretty good based on their price point and if you are looking for something that would help you fry food with little to no oil then you might consider investing in this air fryer. The last model was probably the best one and it has several accessory pieces that you can use in order to cook food. The air fryer comes with a one year warranty so in the case, you have any problems with it you can get it exchanged. However, the peeling off of the paint in the frying basket is something that is a bummer but most of them get a replacement in the warranty period and in the case of the last model, at least you have some accessory pieces to work with. The GoWise Air fryer has these 4 variants, make sure to check them out on Amazon and let us know what you think about them in the comments down below! If you liked the post, share it on Social Media!